In my perpetual quest for cute things for my daughter (and fun things for me to do) I have begun to make custom clothing for her. And in this quest I have found that sometimes craft stores just don't have what I'm looking for... especially when it comes to the design and size of appliques. So I decided to make my own... this ensures that I get exactly what I want for my design AND it saves me money in the long run, which always makes me, and my husband, very happy. 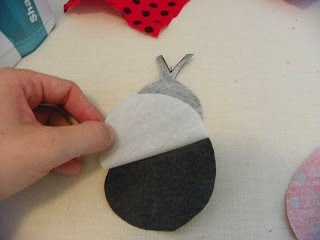 So here are the steps to making your own appliques. Fabrics for the applique, prelaundered as the finished product will be laundered. The first thing you need to do is to design your applique. A simple design with straight sides is easiest for beginners, so consider starting with something like a star or simple house. 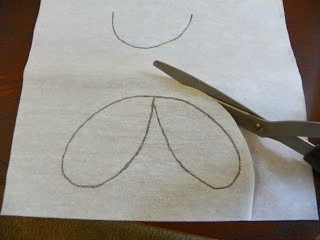 If you’re an experienced seamstress (or plan on sewing by hand) you may want to try a design with curves, like a heart. 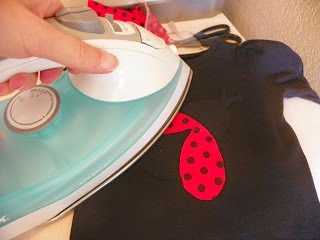 I’m working on a lady bug design for one of my daughter's outfits in the examples. 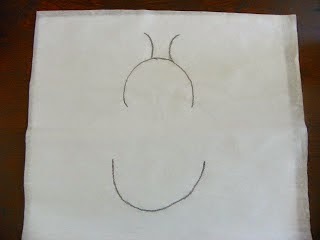 Either draw your design on the plain paper, or trace the design onto the tracing paper. Make sure to make your lines DARK. Keep in mind that the finished applique will be a mirror image of your tracing, this is especially important if you're adding lettering... I learned this the hard way and it was absolutely devastating! The body of the lady bug will got on the bottom so I extended the edges. Place the iron-on adhesive on top of your design, paper side up (look at the instructions for your adhesive, some have paper on both sides but only one side comes off easily. Trace the design on the side that DOESN'T come off easily), and trace your design onto the adhesive. 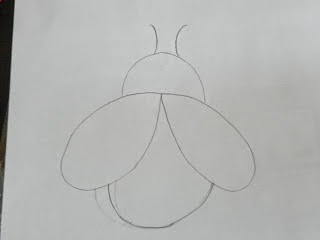 If your design is made up of more than one element, like the lady bug, you will need to trace each section separately. (see pictures below). If there are sections next to each other, you need to decide which will go on top of the other. When tracing, extend the line of the bottom section about 1/4 inch where it touches the top one. This will allow you to layer the sections so there won’t be any gaps in between them (this is VERY important). After your design pieces are all traced individually, You need to separate them from the rest of the adhesive. Cut around your tracing lines, about 1/2 to 1 inch away from the lines. This doesn't need to be exact, just make sure there is space from the lines of the picture and your cut. 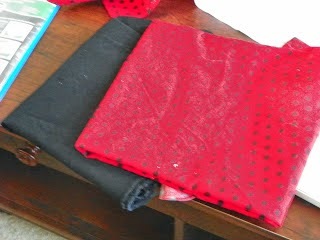 Step 4: Choose your fabrics. beware of fabrics that fray because they often shred when laundered, and thicker fabrics like corduroy or velvet may be too difficult for some machines to handle smoothly. And make sure you wash and dry your fabrics before you work with them so they don't shrink after they've been attached to the clothing. Heat your iron according to the directions that came with the adhesive ( take this with a grain of salt, my iron needs to be WAY hotter than the instructions say, so test it at the instructed level first and then slowly increase as needed). 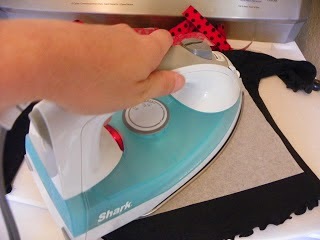 When the iron is hot, place the preshrunk fabric right (front) side down on your ironing surface and press to remove any wrinkles. Be sure to put the side you want to use face down so you’re looking at the back of the fabric. Double and triple check before ironing. Really be careful when your using multiple fabrics where some are solid and don't have a "right" side and some are patterns and do, this can make it even more difficult to remember. Place the adhesive, paper side up, on the wrong (back) side of your fabric. Be sure to remove the cover from the the side of adhesive paper you're putting on the fabric, I know it sounds silly but when you're stressed during your first few times it very easy to forget. Fuse according to the directions that came with your adhesive. 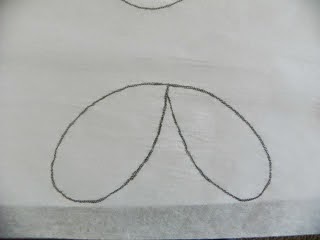 Cut out each section following the tracing lines CAREFULLY. Carefully peel the backing from the design. If it's hard to remove the backing tear one side, or use your finger nail to separate it. Place the applique, adhesive side down, on the item you’re going to apply it to and arrange the sections to match your pattern. If you have several pieces you may need to look at the pattern to remember how the sections fit together. 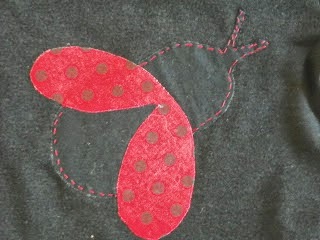 When the applique looks the way you want it to, iron it down according to the directions that came with the adhesive. Remember how the pieces go! Use the water soluble pens to draw in details that you are going to fill in with stitching later. (This is not shown, because the ladybug didn't have these details). 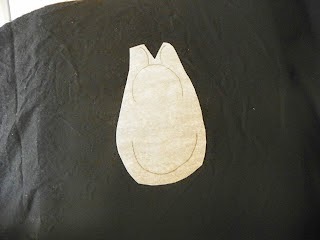 Cut a piece of tear-away interfacing large enough to cover the entire applique with a border of about 1/2 – 1 inch. 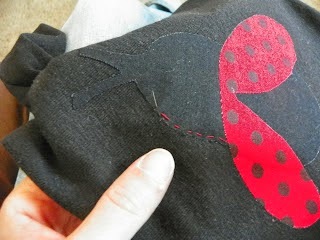 Place the interfacing on the wrong side of the item you’re appliqueing, under the applique. I like the iron-on stabilizers so that's what I use. If you use it to then just iron on the stabilizer like you did the initial applique. If you don't use it then you have to pin it in place. 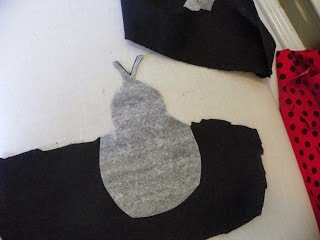 When you're done stitching you can then peel off the interfacing (not shown) and you'll have a nicely secured applique. For most appliques I prefer to hand stitch them because I feel I have more control of the movements, but if you want you can use a machine no problem. For those using the machine first, line the applique up so the raw (unstitched) edge is in the middle of your presser foot and start stitching. 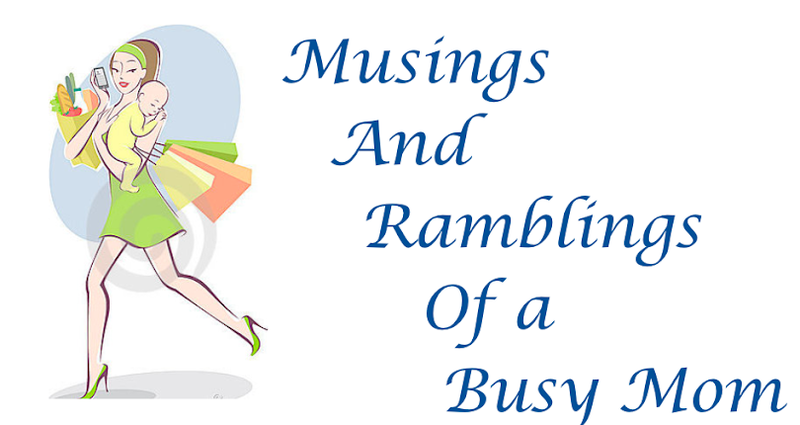 Go slowly at first, until you gain some confidence. Slow down as you approach a curve or corner so you don’t overshoot the edge. Remember to stitch the details you marked earlier. I generally narrow my stitch width by one setting for inner details. Remember to back stitch whenever you begin and end stitching so your stitching doesn’t come out later. When you're done make sure to trim your threads, before trimming make sure to tie your ends so they don't come undone, I also use some liquid no stitch to seal the ends to ensure nothing comes undone.